Cham took responsibility for the curse upon his son Canaan. In their History, his descendants will be subjected to slavery as it was stated: a slave of slaves shall he be to his brothers. Yafeth was the ancestor of the European people: they will be the ones who greatly contributed to the progress of humanity. Their faith, Christianity for most of them, will take its root from the Jewish religion, in other words, Yafeth will dwell in the tents of Shem. But overall, Yafeth descendants will represent a smaller portion of the global population of the world, as they count today for about one billion people (Europe and North America). The sentence Yafeth will dwell in the tents of Shem also refers to Gog and Magog. In Israel, the old city of Jaffa (pronounced Yafo) is said to have been founded by Yafeth after the Flood: from there his descendants would have built boats and ventured to the expanse of the sea to populate the Greek islands. Shem gave birth to the people who populated Asia and maybe also the Americas, as Native Americans, unless these people were descendants of Cain and survived the Flood by seeking refuge in the highest mountains of Asia and America. Or they may survived the Flood thanks to skills of navigation on rafts or boats: they would have sought refuge in them when water levels started to rise. This is because God eradicated all living creatures on earth and in the sky, but He did not destroy life in and on the seas. And Japheth and his sons went towards the sea and dwelt in the land of their portion, and Madai saw the land of the sea and it did not please him, and he begged a (portion) from Cham and Asshur and Arpachshad, his wife's brother, and he dwelt in the land of Media, near to his wife's brother until this day. And he called his dwelling-place, and the dwelling-place of his sons, Media, after the name of their father Madai. The full understanding of Gog and Magog will become clear in the Messianic times. - Mizrayim: ancestor of the people who re-populated Ancient Egypt after the Flood; the previous dynasties of Egypt formed what was called the Old Kingdom; but although this kingdom was prosperous and mighty, and during which the great pyramids were built, it came to an end before 2000 BCE caused by climate changes; then came what was called the First Intermediate Period of Ancient Egypt, which is described by historians as the "dark period"; this period probably corresponded to the return of people into the Nile valley after the Flood, and it took about 100 years before Egypt would witness another period of prosperity with the so-called Middle Kingdom; Egypt at this time was named "km.t" in hieroglyphic language which is translated as black land. Archaeologists believe they named it as such because of the nature of the Nile flood sediments that turn the land into a cultivable region and the soil to be of dark (black?) colour. However there may be another explanation. The "km" in the name "km.t" is identical to Hebrew חָם, pronounced Cham ("km" could also have been pronounced "kam, as voyels were not counted in these early languages). So "kam.t" would have simply meant the land of Cham, as Cham was the son of Noah who settled south from his brothers, went down to the African continent and gave giving birth to the Egyptian and African people. Five things did Canaan charge his sons: Love one another, love robbery, love lewdness, hate your masters and do not speak the truth. In the land that Canaan chose, they also started to build harbour cities, like the sons of Japeth did in Crete, rather than confining themselves to land. 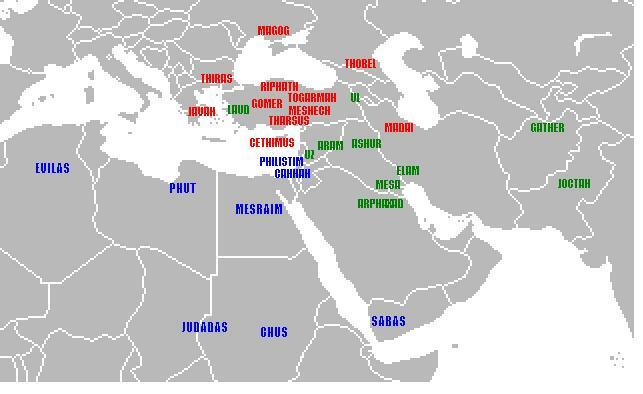 So they built early city ports along the shores such as Gaza, Ashkelon, Ashdod, Arsuf, Dor, and so on. He was the ancestor of the people of Heber. Heber will be the ancestor of the Hebrew people. But his Hebrew name also means "to cross over" or "the past". So the text can also be read as saying Shem was the ancestor of those who went to the past, meaning back to the original location of the older kingdoms of Mesopotamia.